Occasionally I remember that I once wrote something that tangentially connects to the events of the day. So I throw a fancy intro on it, update a couple of the subjects and there it is: today's weblog. Backtime may have found the smoking gun: Jason Collins, a grown man, smiling widely at a wedding. We should have known it then. At least I think the tooth whitener model is Jason (his twin brother Jaron was also a groomsman and I don't know them well enough to tell the difference). Jared Stacy and Caitlin McGinty Stacy are happily married (I assume), though Jared shed the humble associate producer title long ago. He's bigger in the NBA now than either of the wedding's bookends. And I continue to plod along in my career. Though I'm in a committed, long-term relationship with the ceremony's most beautiful attendee. So in honor of Jason Collins, a fine NBA center, please enjoy this re-post. Spent the past weekend out west. 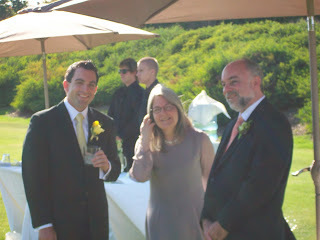 Attended a family wedding at the picturesque Montecito Country Club in the Santa Barbara hills, overlooking the Pacific. This is an important moment since there was something from his lovely bride, Caitlin McGinty, in the wedding vows about an 80-year contract. That's going to be tough to renegotiate. As for the sports angle, the groomsmen included a couple of NBA big men, Jaron and Jason Collins, who attended Stanford with the groom. 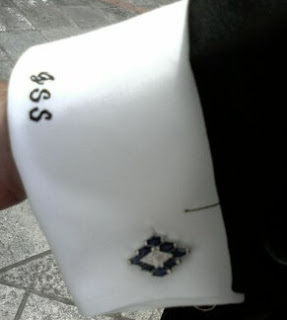 Legendary Dodgers' broadcaster Vin Scully was working and couldn't officiate the ceremony, but he lent Jared his cuff links for the occasion. Good nuance at the reception. The house red wine was Syrah. The Irish folk dancers were captivating (later emulated by the bride and her siblings). The cupcakes were the best ever. As for me, with my bride stuck in the Savannah weather center due to a staff wedding down here (congrats to David & Jess by the way), I brought a younger woman. No such weather issues on the California coast. This one stole the show on many occasions. Except for my pregame Friday Night toast when I had to explain to her that at least for a few minutes that I was Paris Hilton and she was the chihuahua. That's alright, take an 80-year contract with her any day.